It's been raining for more than a week now. One thing that I like during the rainy season is a cooler temperature. Hubby don't have to turn on the AC at night but he can't sleep without the fan though. Although it's cooler these past few days but still, hubby wants it cold when he go to sleep. Our electric bills last summer were way too much due to the nightly use of the AC not to mention the continuous use of the fans daily, tv, internet, fridge, washing machine, water, electric iron, coffee maker and water heater as well. We've been making the electric company richer and us poorer. I'm keeping my fingers cross that our electric bill this month will be much lower than last month. I really like the weather now but my heart goes to those people who were affected by the typhoon and flooding. We are really thankful to God that we are safe here where we are and we praise Him for that. It's been a year since I forgot my diet and the result is a staggering weight gain. I need to lose at least 15 lbs. I used to be fit and trimmed for the past few years due to regular diet and exercise. Since I started taking vitamins and supplements which I bought in the US last year, my appetite has increased and hard to control. I also became lazy doing my exercise, hence I became heavier. Every time I look at myself in the mirror, I see those love handles and I don't like it. My clothes are shrinking and if I don't do something, my clothes won't fit me no more. I can't afford to buy new set of clothes so I started to ride my stationary bike and my orbit track which have been kept and unused for quite a while. I need to have self discipline in eating and also do my workout regularly if not daily. I know I can do it. I did it before and I can do it again. I thank God for giving me another year. I'm so blessed beyond measure that God let me live up to this day and the days to come. Fifteen years ago I thought I would not live long to celebrate my birthday due to the big C but God in His mercy extended my life. I know He has still a plan for me and I didn't know it then until hubby and I decided to come back to the Philippines 4 and half years ago and start a ministry for the Lord. Now I know why I'm still here in this world, to help hubby in the ministry and minister to the lost. I know this is what I'm called for, to be a missionary and there's no greater honor, no higher calling than to serve God. 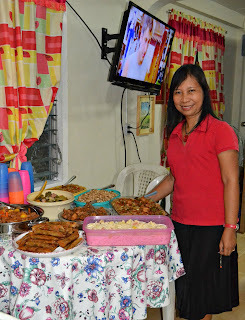 To celebrate my birthday and thanksgiving to the Lord, we prepared some foods for supper. True to his word, my youngest brother came early this morning and helped in cooking. He grilled chicken breasts and prepared it like "kilawen" style. He brought with him his wife's aunt to help us. Then after lunch, my uncle, his wife and granddaughter came to help in cooking too. They cooked the beef caldereta, chicken adobo and pinakbet. I did the vegetable lumpia and pancit. The night before, I made the agar-agar fruit salad. Some members of our church came, our neighbors and kinfolks and my siblings and their families of course. I got two roll cakes courtesy of my brother-in-law and family and from a family who just joined our church. I was really ecstatic and blessed. A lot of people got full and that includes me, lol! 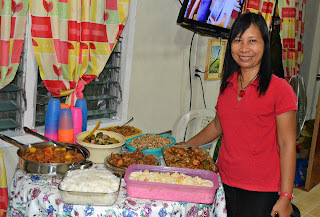 Thank you Lord for your unending blessings and provisions and thank you for my loved ones, family and friends who came and celebrate my birthday with me. Lord, thank you for my life and my salvation and continue to use me for your glory until you call me home. I love you Lord. Happy 1st day of August! Oh my golly, guacamole! Time is passing by so quickly! But anyway, this is my favorite month for the reason that this is my birth month. 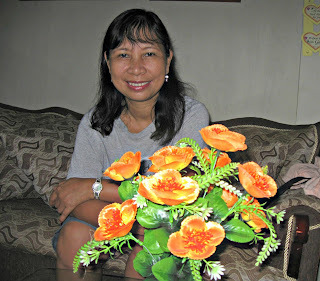 In just a few days, I will be celebrating my natal day and that will be this coming Monday. My youngest brother has been asking me what will I prepare on my big day. I said that I'm not planning anything because I cannot do all the cooking by myself to feed a clan unless he volunteer to do it. Straight to the point. Then he said, he will come and do the cooking. We'll see.